Today, there was a dress ceremony on B ward. It’s to celebrate a fistula patient becoming dry. Every lady receives a new dress to go home. It’s one of the most special celebrations on the ship. Each lady has a chance to share her story and give thanks and praise to God. I was able to see a bit of the ceremony. One lady told us how she had been wet for over 20 years. She thanked God and she thanked us. Then she sang a beautiful song. Then she cried tears of joy and relief. We cried with her. Another girl told us she was wet for 18 months. She was at university to be a doctor then, but she dropped out because of the shame. Now she can go back to school. The last story was from another older woman. She searched many hospitals for a cure. No one could help her. Then she had a bad accident on top of it all. She lost everything. She was here in Conakry trying to find money to go home when she heard we were coming. Now she is healed. She began a song and humbly bowed low to the ground to walk among us as she said thank you. As she passed my way I touched her back and thought, I should be thanking you sweet lady. God is so good. I can’t wait to come back to this place. 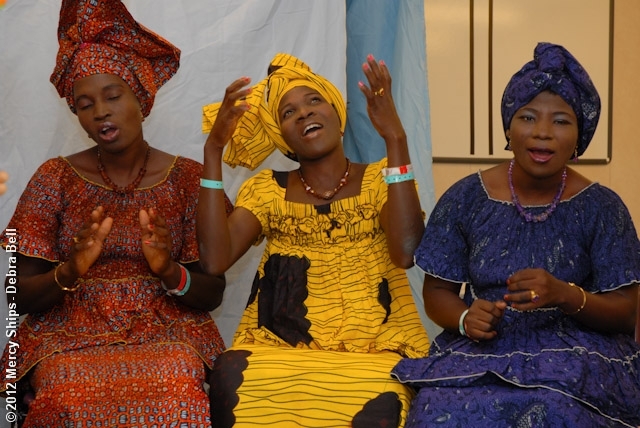 This entry was posted in Mercy Ships, mission and tagged Blessings, celebration, dress ceremony, fistula, Praise, Surgery. Bookmark the permalink.
. To be Released from shame…what a powerful, powerful gift.